The protective container with Ariane 5’s EPC cryogenic main stage is unloaded from the MN Colibri roll-on/roll-off transport ship. Preparations are starting for another busy year of Arianespace launch activity, with the initial Ariane 5 of 2017 now delivered to the Spaceport in French Guiana. This vehicle recently arrived in French Guiana aboard the MN Colibri, which is one of two roll-on/roll-off ships that transport Arianespace launchers from their European manufacturers to South America. 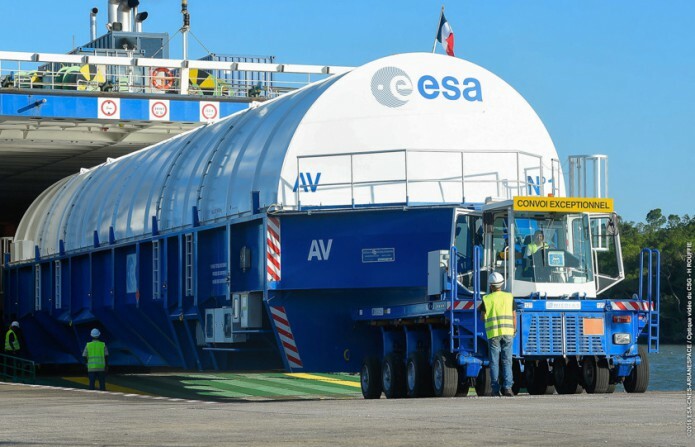 After docking at Pariacabo Port, the Ariane 5’s components were unloaded and transported by road to the Spaceport – where they will be assembled during activity inside the Launcher Integration Building. The first Ariane 5 mission of 2017 – designated VA235 – will orbit a pair of communications satellites: SKY Brasil-1, for operation by DirecTV Latin America; and Indonesian service provider PT Telkom’s Telkom-3S. A total of 232 Ariane missions have been performed since the family of European launch vehicles began operation in 1979. Number 233 will be marked on Arianespace’s next flight from the Spaceport, scheduled for November 17 – during which an Ariane 5 ES version will loft four satellites for Europe’s Galileo navigation system. So far in 2016, Arianespace has conducted five flights with the heavy-lift Ariane 5. This activity was complemented by two missions using the medium-lift Soyuz, plus one with the lightweight Vega vehicle. Arianespace’s 2016 launch activity will be completed with two December missions: the Vega flight with Turkey’s GÖKTÜRK-1A observation satellite, which will be followed by an Ariane 5 mission to orbit the JCSAT-15 and Star One D1 telecommunications relay platforms.